The feedback that y’all submit via http://feedback.live.com for Windows Live Writer will occasionally make its way into my inbox and I just started to read through what was submitted for the month of October. It is anonymous feedback and I really wish that at times it was not because I would love to reach out at times with replies or follow up. Please remember that for support with any part of the Live suite please look to the forums (for Writer it is here) as the support team is really not looking at feedback. Unfortunately Window Live Writer 2011 editor does not have rtl (Right To Left) option, it’s a simple but important thing that I need, it have over N very nice feature … but for only 1 feature I have to deprecate Windows Live Writer. i’m a .NET developer please tell me can I develop and add this feature to it’s editor?? The fact of the matter is that Live Writer does support Right to Left text entry. Hebrew and Arabic, and the non-Semitic languages using the Hebrew or the Arabic alphabet, such as Urdu, Yiddish, or Persian, are written right to left. In Writer, you can set the paragraph direction at the paragraph level. Where I suspect that the confusion arises in the feedback because the ribbon buttons for text direction do not appear in Writer unless you have a blog that supports right to left or you have installed the localized version of Writer like the Arabic version. You can always toggle the direction of text without the ribbon buttons however. When you add a blog account one of the things that Writer attempts to detect is the reading direction of your blog. If it is in fact right to left, you will see the buttons in the ribbon for paragraph text direction. For any blog you can set the reading order for your blog by going into the Blog Options from the Blog Account tab. Select Editing and then you can set the text direction. 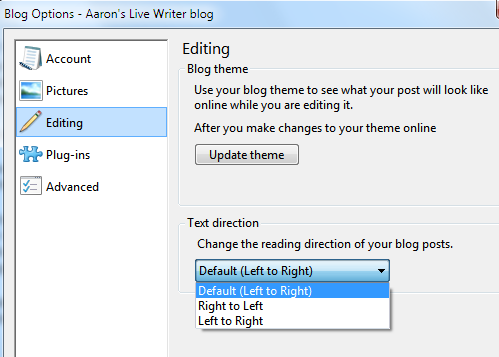 If your blog does default to Left to Right but you need to enter text that is Right to Left you can use Left Ctrl+Right Shift to set the paragraph to RTL. To switch back to LTR you can use Left Ctrl+Left Shift. You would use these same keyboard shortcuts in Office applications like Outlook or Word. Hopefully this clears up some of the confusion around how RTL works in Writer. I appreciate the someone had reached out for the team asking how to add support for RTL. RTL exists in the Writer versions before the 2011 version but there were minor improvements made for 2011 especially with the addition of the ribbon.